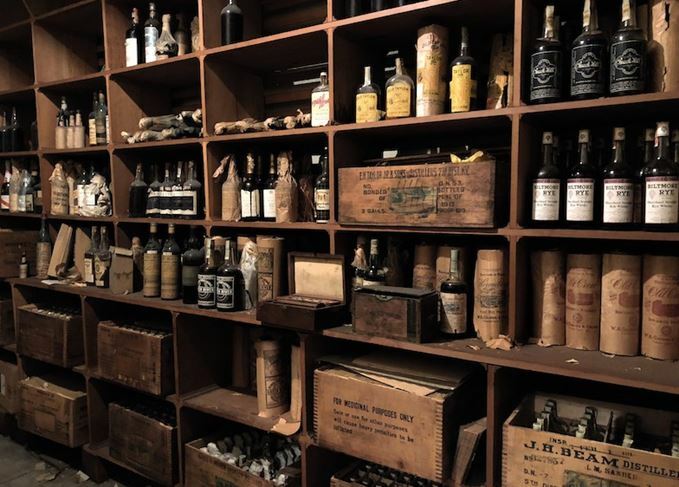 A hidden stash of century-old, pre-Prohibition American whiskey which lay hidden in a secret vault will be auctioned by Christie’s in New York next month. The sale, which takes place on Friday, 7 December, is billed by the auction house as ‘probably the greatest collection of historic Madeira and spirits ever to be offered for sale at auction in the United States’. More than 40 cases of unopened bonded whiskey, some of it distilled as early as 1914, were discovered in 2017 in a property in Hancock Park, Los Angeles, hidden in a secret vault built by banker and trader Jean-Baptiste Leonis in the early days of Prohibition. According to Christie’s, the vault room was constructed behind a ‘Prohibition-era’ bookcase façade, protected by a 10-bolt, vault-style door – features which the auction house said would have been ‘easily added’ to property designs ahead of the introduction of Prohibition in 1920. Featured lots at the auction include multiple cases of century-old pint bottles of Hermitage whiskey distilled in 1914, Old Crow distilled in 1912, and Biltmore Rye Maryland Straight Whisky in bottles labelled to order for the Biltmore Hotel in Los Angeles. Leonis was a trader who opened the Santa Fe Ave Mercantile Co. at the end of the 19th century, working as a liquor dealer and importer in Vernon, California. Christie’s senior wine specialist Scott Torrence writes in the auction catalogue that the whiskey cellar housed ‘massive volumes’ of spirits, including 38 unlabelled demijohns of unidentified distillates, as well as items mysteriously labelled ‘Very good whiskey 104’ and ‘Very old whiskey 104’. A hidden stash of American whiskey fetched thousands more than expected at auction.